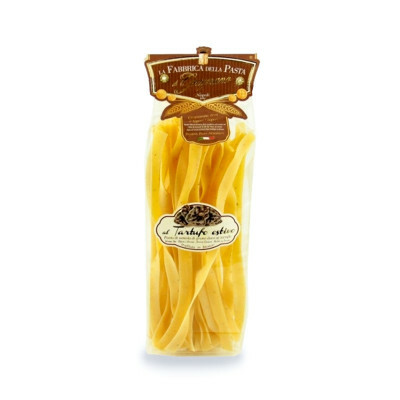 Quality Italian pasta, with the intense and unmistakable taste of the best summer truffles. Truly gourmet. Truffles are a beloved ingredient in Italy, a country which produces some of the finest in the world. Their flavour is unlike any other and dishes including them are well-known for being incredibly gourmet. Intensify the aroma by saving half a cup of the cooking water and adding it to your drained pasta. It will add even more flavour and texture to the pasta, which should be served with simple sauces such as oil and a sprinkling of Parmigiano or perhaps with a dash of cream of a few prawns. Durum wheat semolina, Gragnano's water, (summer truffle pieces origin Italy, salt, aromas) 3%. WHEAT.